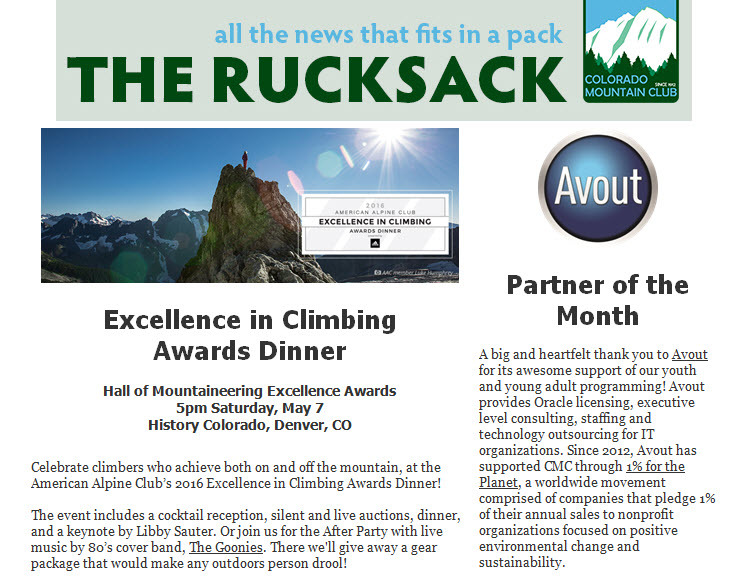 For the past two years, Avout has contributed to Colorado Mountain Club. We are proud to have been instrumental in founding Alpine Start, a program that focuses on bringing 18- to 25-year-olds together for fun and challenging activities that develop their outdoor and leadership skills. In 2015, Avout’s donations also began funding the Youth Education Program, focused on elementary and middle-school aged children. Read the latest issue of The Rucksack to find out more about what Colorado Mountain Club does for the Colorado community. With each dollar we earn, we give back to the community. Are you part of a Technology organization? By working with Avout, you’ll contribute to causes that keep our planet in business, like Colorado Mountain Club. Avout provides the right staff, at the right time, at the right price to get IT initiatives accomplished. Since 2010, we have helped organizations apply Oracle, Microsoft, SalesForce, Cloud Computing, and other technologies to grow their businesses. Email Barry.Wiebe@Avout.com to discuss your technology needs.